Good Morning! 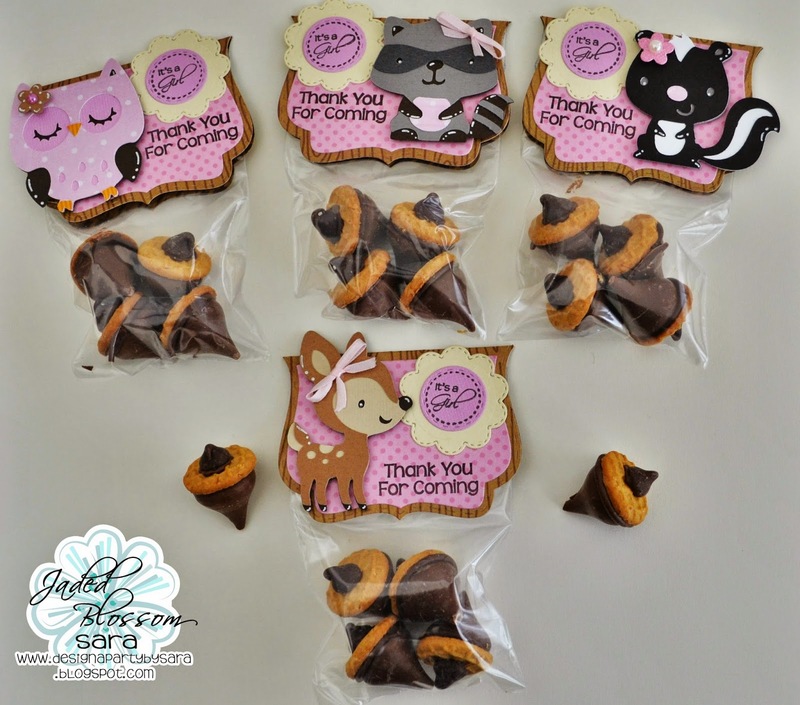 It's Sara from Design a Party by Sara! It's my day here at Jaded Blossom to share a project with you. I was asked to create some baby shower items for a friend. I love the theme they had picked out. 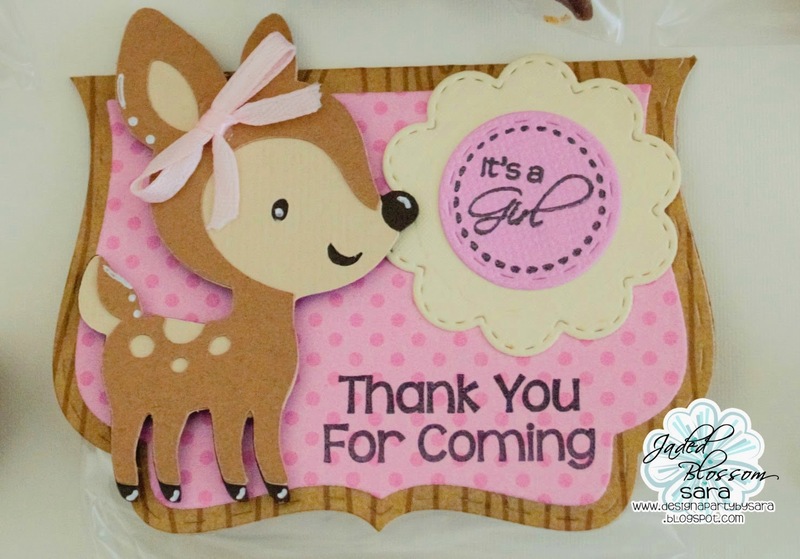 They wanted a woodland animal theme and to use brown and pink. She sent me a pic for reference so I went from there. Here is what I created for her. 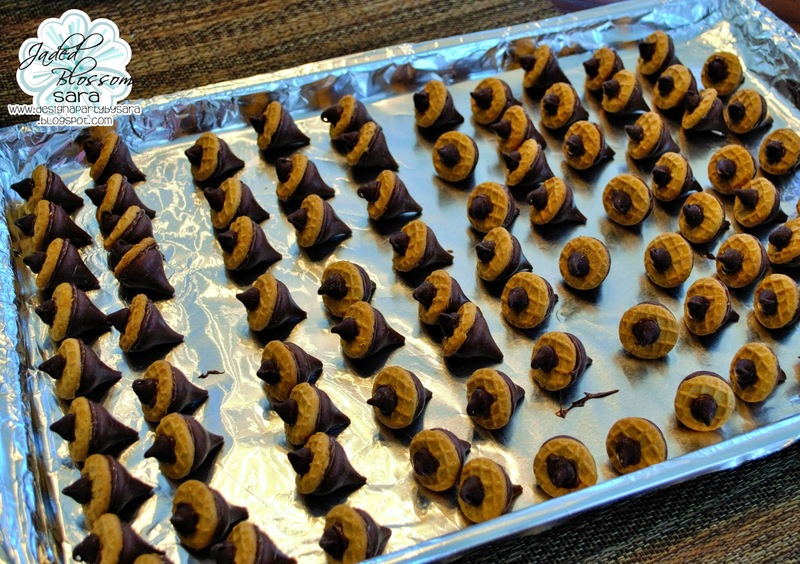 I usually don't make the treat part, I only make the container in which it will go in but she asked if I could make these fun little acorn treats. They were really easy. Here are the acorns. I used the mini nutter butter cookies, Hershey kisses, melted chocolate squares and chocolate chips. I pulled the nutter butter cookies apart and scraped the peanut butter filling out. I unwrapped all of the kisses. I dipped the kiss into the melted chocolate and then added the cookie top, dipped the chocolate chip into the melted chocolate and added it to the top of the cookie. They were really easy to make. I used my cricut and my favorite cartridge Create a Critter for these adorable little critters. 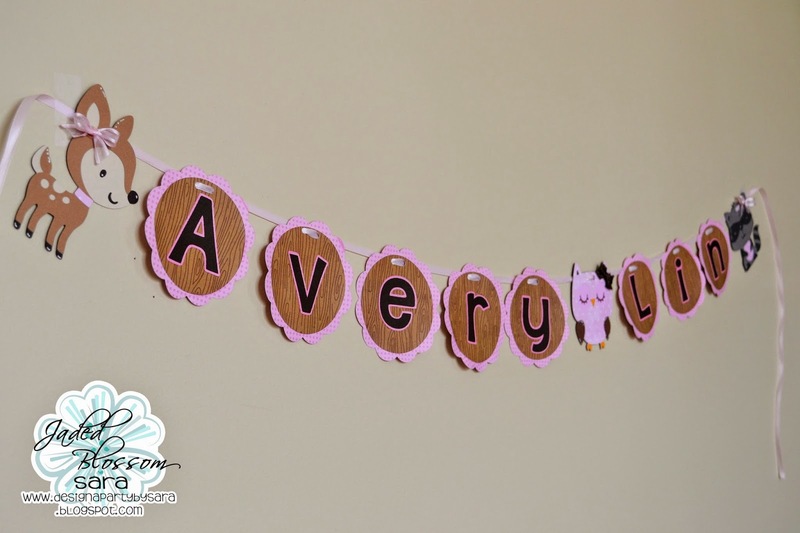 She also wanted a banner with the baby's name to put in the nursery after the shower. I used the Banner Shapes Simple from SVG cutting Files and the critters from create a critter once again. I hope you enjoyed my shower decorations today! You can shop the Jaded Blossom store HERE . Join the Facebook group HERE and share all of your Jaded Blossom creations. Aaaw, your treats are adorable! They look delicious! I love the theme for the shower..the banner is fabulous! Great job on this! The banner is just ADORABLE!! As for the treats..AWESOME! Super cute & fun!! Your banner and treats are adorable. I bet everyone loVed them Thanks for sharing.